Yet Sanguillen had other dimensions. With his strong arm, he caught 39% of the runners who tried to steal against him during his career. He was popular, with a broad, gap-toothed smile, and well rounded enough as a player to make the National League All-Star team three times. He also received MVP votes in four seasons. Winning the 1971 World Series was the highlight of Manny’s career, but he counted catching Bob Moose’s no-hitter on September 20, 1969 against the New York Mets as his proudest accomplishment. It was an example of his maturation in calling a game. Manuel de Jesús Sanguillén Magán was born on March 21, 1944, in Colón, Panama. This is the nation’s second biggest city, lying near the Atlantic entrance to the Panama Canal. Note that in Spanish, the accent falls on the last syllable of his surname, but in the U.S., it was typically pronounced “San-GHEE-yen.” His father, Helio Sanguillén, was a fisherman. His mother, Zoila Magán, had 12 other children (six boys and six girls). Manny was right in the middle. Those who were fortunate to see Manny Sanguillen play might not realize that he began playing baseball later in life. Instead, he preferred playing basketball and soccer as a youth. He also boxed, winning five of his seven bouts. When he did play baseball, it was mostly in the infield or outfield. Manny played a little at catcher but it was not his preference. The man who made a pro baseball player out of Sanguillen was Herb Raybourne. Raybourne was a former pro (1959-61 in the minor leagues) who had grown up in Panama. He was an insider on the local baseball scene — in fact, he won the Panamanian batting title in the winter of 1960-61 — and went on to become an eminent scout. He became best known for discovering Mariano Rivera, but Sanguillen was the first of several prospects he found for the Pirates on the isthmus (the other biggest names being Rennie Stennett and Omar Moreno. Though he kept on playing winter ball in Panama, Raybourne taught and coached baseball at a local high school. It was during that time that he went into scouting. Raybourne had done a little catching himself and after seeing Sanguillen catch, he convinced him to play behind the plate. Herb felt that the young Panamanian had the perfect frame — Manny was built like a bull at 6’0” and 190 pounds. Raybourne first saw Manny play on a team made up of much older players. When the Pirates scout found out that the Houston Astros were also interested in the young catcher, he frantically wrote to Pete Peterson, the Pirates’ director of scouting. Peterson sent Howie Haak, who was considered a ‘super scout’ in the Pittsburgh organization and gained acclaim for opening up all of Latin America to the majors. When Haak came to Panama, he asked Raybourn to run the prospects. Herb had a group of 10-12 players. The crafty scout held Sanguillen back to run last, in an attempt to showcase his exceptional speed for a big man. He ran an impressive 6.6 in the 60 yard dash. After a brief conversation, Sanguillen calmed down. He read his Bible and prayed. It was the start of a trusting relationship between the catcher and his future manager in Pittsburgh. During the 1971 World Series, Murtaugh sought his opinion on the Oriole batters. The Pirates were pleased with Sanguillen’s brief performance. They recommended that he play winter ball again. This time he went to the Dominican Republic, joining Águilas Cibaeñas. Pittsburgh also sold Jim Pagliaroni’s contract to the Oakland organization. Unfortunately, Manny broke a finger, which prevented him from making the opening day roster for 1968. Instead, he returned to the Columbus Jets, managed by Johnny Pesky. The injury hampered his hitting early in the season, but he batted .387 over his last 87 games to finish with a .316 average. Eventually, Sanguillen became the regular behind the plate by virtue of his strengths, which made the young backstop’s English tolerable. Pirates reliever Chuck Hartenstein explained, “…everybody knows ‘in and out’ and ‘up and down’. That’s the primary part of pitching.”14 Shepard did not publicly announce Sangy as the starter, but May accepted a supporting role, committing to helping his rival become better. Fortunately for Sanguillen, he had several Latin friends and role models on the club — players like Matty Alou, Manny Mota and José Pagán. Of course, he also played with Roberto Clemente, who acted like his older brother. Sanguillen also developed a special relationship with trainer Tony Bartirome. Tony, Manny, Pagán, and Alou were all big boxing fans. They regularly went to boxing matches in East McKeesport, a suburb of Pittsburgh. Sanguillen discussed his peak personal accomplishment — handling Bob Moose’s no-hitter — in a conversation with the author. He proudly explained how they mixed pitches: the knuckle ball, sinker, and sidearm delivery. They alternated them for each inning. It was a windy day at New York’s now-demolished Shea Stadium, so the knuckler was especially successful. In the ninth inning, with two outs and Rod Gaspar at second, Art Shamsky bounced a ball to Dave Cash, who flipped to Al Oliver to end it. Moose won 4-0, walking three, while striking out six. The game also featured a one-handed grab by Roberto Clemente on a ball hit to the fence. 15 Ironically, Moose was responsible for Manny’s lowest point in his career, a wild pitch that ended the 1972 NL Championship Series on October 11, 1972. Sanguillen continued to gain respect around the league for his catching; unfortunately his ascension was largely overshadowed by Johnny Bench. The 1970 season marked the second consecutive year that Sangy’s batting average rose. His .325 was third best in the National League. The Pirates won a division title; only to lose in the NLCS to the Cincinnati Reds, led by Bench. Sanguillen had a quiet series against the Reds, going 2 for 12. That season, Sanguillen finally began to get the reputation as one of the best all-around catchers in baseball. Meanwhile, Bench — the defending NL MVP — had an off-year. Sanguillen was chosen for his first All-Star team in 1971. Still, he did not play; Cincinnati manager Sparky Anderson decided to use Bench for the entire game. The two of them also differed. Bench was glamorous, cool and unflappable. Sanguillen, on the other hand, was wildly demonstrative with unabashed enthusiasm. Sometimes his ebullience was misinterpreted as “hot-dogging.” Bench had much more power, but Sanguillen hit for a higher average and had unusual speed on the base paths for a catcher. Bench was also one of the foremost defensive catchers of his day, though Sanguillen polished his skills in this area. Pittsburgh repeated as winners of the NL’s Eastern Division. Sanguillen ended the 1971 season by batting .319, his third consecutive season over the .300 mark, with 81 RBIs. The Pirates went on to meet the San Francisco Giants in the NLCS; Sanguillen’s 4-for-15 performance was steady, yet unspectacular. He must have been saving his best for the World Series. The Pirates and Orioles met on October 17, 1971 to play the seventh and deciding game at Memorial Stadium in Baltimore. The pitching matchup was the same as in Game Three, Blass against Mike Cuellar. Baltimore trimmed Pittsburgh’s lead to 2-1 in the bottom of the eighth and had the tying run on third with two out. Blass and Sanguillen conferred on how to pitch to Davey Johnson, who had seen nothing but sliders all day. They looked to surprise him by setting up for another slider away, then coming with a fastball up and in, but eventually Blass retired Johnson on another slider, not his best. Blass retired Baltimore 1-2-3 in the ninth, and the Pirates were champions. The Pirates began preparing to replace Roberto Clemente in the outfield during the 1972 season. 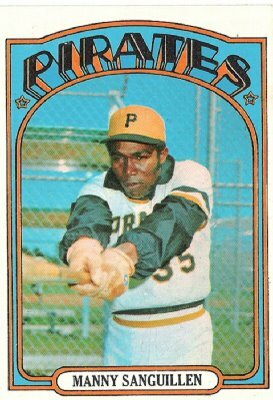 They eyed Sanguillen as his successor, which would also have paved the way for Milt May to start behind the plate. Sanguillen, who had gained some outfield experience in the Puerto Rican Winter League, was willing to give it a go. The experiment was largely confined to the exhibition season, though; he played just two games in left field during the 1972 season. That year, Manny missed joining the five other catchers in NL history who had posted four consecutive .300 seasons; he batted .298. Still, once again he was named to the All-Star game.24 This time he actually played. Manny replaced Bench in the sixth. He bounced out to second his first at bat, but his ninth-inning single helped to tie the game, and the NL won in the bottom of the tenth. During the 1972 offseason, Clemente invited Sanguillen down to Puerto Rico once more to play winter ball for the San Juan Senators. The Senators were coached by Roberto and stocked with several Pirates teammates, including Richie Zisk, Rennie Stennett, and Milt May. It was a great way for Sanguillen to stay in baseball shape, and he worked again on playing the outfield. Clemente had taken the young Panamanian under his wing, acting like an older brother. He enjoyed good-natured teasing. “Sangy, what position do you play in the winter league?” asked Clemente. “Right field, I play twenty in right, one in left,” replied Manny. The loss of Clemente led the Pirates to accelerate Sanguillen’s move to right field during spring training. No one expected him to be another Clemente, but he showed early signs that he would be an above-average outfielder. He opened the 1973 season in right field. Unfortunately, Manny had more difficulty adjusting than expected. “Only I wish there was somebody in right field to talk to” he remarked.28 It soon became obvious that he and right field were not a match. The club started off terribly. Sanguillen was moved back to catcher by June 15. He set highs for games played (149), home runs (12), and extra base hits (45), but his batting average dipped to .282. His defense behind the plate was not as crisp as usual since he played 59 games in the outfield. Sanguillen’s batting average returned to the .300 level in 1975 — in fact, he hit a career-best .328, placing third in the NL. In part this was because he got more rest; the Pirates had obtained Duffy Dyer over the off-season.30 Batting in the #2 hole, the free-swinging Panamanian demonstrated more patience at the plate than ever before. He set another career high by walking 48 times. Sanguillen was selected to the All-Star team but once again spent it watching it from the bench. The Pirates won the NL East by 6½ games over Philadelphia but were swept by Cincinnati’s Big Red Machine. In 1976, the Pirates did not win the NL East, for only the second time to that point in the decade. The Philadelphia Phillies were a rising power. Many of the Pirates became old; several of their perennial stars began to fade. Sanguillen batted .290, but he battled a sore shoulder the entire season. As if the season was not disappointing enough, the team lost two members of its family during the off-season. Pitcher Bob Moose was killed in a car accident after celebrating his 29th birthday. Then in December, Danny Murtaugh (who had announced his retirement) died. The third blow to Pirates fans came when the club traded fan favorite Sanguillen. Pittsburgh had signed Chuck Tanner as manager from the Oakland A’s, and A’s owner Charlie O. Finley demanded the catcher as compensation. Manny spent one year in Oakland. He appeared in 152 games and batted .275, mediocre for him. He split catching duties with Jeff Newman and was the team’s most frequently used designated hitter (the only time he ever served in this role). Sanguillen’s playing time was limited almost strictly to pinch hitting in 1980 — he did not appear once behind the plate. Following the end of the season he was included in the trade that sent Bert Blyleven to the Cleveland Indians. Sangy was released during spring training 1981 and he retired. Manny Sanguillen has remained a Pirates fan favorite in and around the Pittsburgh community. He is active in many of the Pirates’ alumni events. Sangy has also served as a guest catching instructor during spring training since 2002. Also in 2002, he agreed to host a barbeque stand behind centerfield at PNC Park that bears his name. He regales fans with stories about the glory days of the team. 1 Steve Blass and Erik Sherman, Steve Blass: A Pirate for Life, Chicago, Illinois: Triumph Books, 2012, 97. 5 Herb Raybourne, telephone interview with author, August 13, 2013. 9 Abdiel Flynn, “Rummies Romp to Fast Start, Swing Hot Bats,” The Sporting News, December 25, 1965, 35. 10 Abdiel A. Flynn, “Buccos Boast Gem in Rough — Sanguillen’s Sizzling Warclub,” The Sporting News, February 5, 1966, 30. Abdiel A. Flynn, “Desousa Bat-Title Surge Falls Short,” The Sporting News, February 12, 1966, 26. 11 Abdiel A. Flynn, “League Officials Nix Plans to Add a Fourth Team,” The Sporting News, November 5, 1966, 41. 17 Charley Feeney, “38,000 See Bucs in Panama,” The Sporting News, March 27, 1971, 34. Dave Eisenberg, “Golf Keeps DiMag in Top Condition,” The Sporting News, March 20, 1971, 55. 18 Ron Fimrite, “Two Catchers Cut From Royal Cloth,” Sports Illustrated, June 26, 1972. 19 Ron Fimrite, “Two Catchers Cut From Royal Cloth,” Sports Illustrated, June 26, 1972. 21 Markusen, The Team That Changed Baseball, 158.